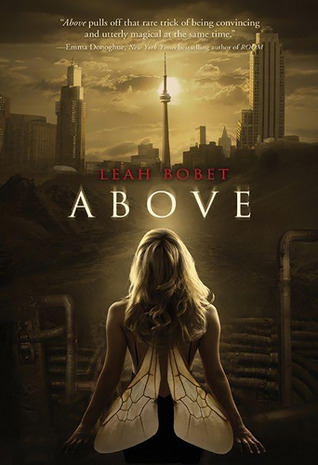 Leah Bobet’s Above has amazing cover art, and I’d be lying if I said that it didn’t influence my decision to add it to my wish list. But adding a book to my list doesn’t necessarily mean I’ll buy it. What tipped the scale was a positive mention by one of the book bloggers I trust for quality young adult and middle grade sci-fi and fantasy recommendations – Charlotte’s Library. I know I say it over and over, but one of the best things about blogging is finding fellow readers with similar taste, and following their lead into the great unknown. Matthew has loved Ariel from the moment he found her in the tunnels, her bee’s wings falling away. They live in Safe, an underground refuge for those fleeing the city Above—like Whisper, who speaks to ghosts, and Jack Flash, who can shoot lightning from his fingers. The cover might convince you that the protagonist of Above is a girl with wings. But while she (Ariel) is quite beautiful, the book is instead the story of a boy named Matthew, or ‘Teller.’ His attempt to remake his own ‘safe’ place after its invasion is the central adventure – that and his need to protect Ariel, the damaged girl from the cover, and his duty to remember and ‘tell’ the true stories of the inhabitants of his underground home. But what is Above? It is more than a book about a boy and a girl. It is the story of a rag-tag community and its broken, hurting members. It is the story of danger, abuse, of healing, of trying to find a place to be safe. It is a sharp, biting, and exquisitely written story that deserves the adjective “haunting.” It is all hard angles and uncomfortable truths and dark, secret things. The prose, though – the prose! It’s exceptional. Feeling bled through words and heightened every sense, every reaction. Above was tense, mad, sorrowing, and altogether lovely. It will be one of my favorite books of 2012, I am quite sure. There were several unusual elements present in the story: the connection of fantasy and mental illness, a discussion of psychiatry and its fringe elements of society, a bi-racial protagonist (and how I wish I didn’t have to write that that was unusual! ), and a trained storyteller of a protagonist letting bits of the tale go free piecemeal. The glory of the reading experience was in the discovery of truths that hurt and pulled and tore – forming you, and the characters, into new people. Recommended for: fans of China Mieville, Neil Gaiman, Kate Griffin’s A Madness of Angels, those who prefer a dark bite to their fiction, and anyone who has wondered if perhaps the shadows are stalking them – and why this should be so. I just couldn't get into A Madness of Angels. Might give it a second chance. Liviania: I never connected strongly with a character in A Madness of Angels, but I felt as though the city and the descriptions were almost characters in and of themselves. That's what I thought of as the thing that would link it to Above. Anyway, it's a weird roadmap of books I have in my brain - and it won't be the same for everyone. I'm glad you liked it! It was very different in feel from the books I usually recommend. I totally agree about the quality of the writing--this was her debut, and I can't wait to see what she writes next! All I get from the cover is CN Tower... and that alone appeals to me and my Canadian roots... then reading this post, I am totally intrigued! Your review of the book made it sound good, but your adding in The Madness of Angels recomendation had me. I love that series.